Click HERE to listen to the Dharma Talks, Morning Reflections and Instructions from the Retreat. 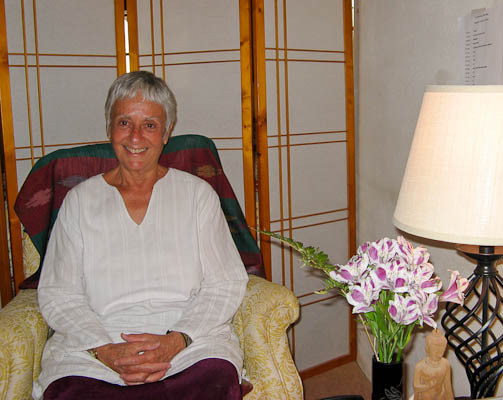 Marcia Rose is the founding and guiding teacher of The Mountain Hermitage and founding teacher of Taos Mountain Sangha. She has been studying and practicing Buddhist teachings and meditation with Asian and Western teachers since 1970, primarily in the Theravada-Vipassana (Path of the Elders) tradition. Her own teaching reflects a clear influence from the Burmese Mahasi Vipassana and Pa-Auk Forest Monastery lineages with authorization from Venerable Pa Auk Sayadaw to teach Samatha and Jhanas in his lineage. She has also studied and practiced in the Dzogchen Tibetan Buddhist tradition with Tulku Urgyen Rinpoche, Nyoshul Khen Rinpoche, and Tsoknyi Rinpoche. Marcia was resident teacher for staff at the Insight Meditation Society (IMS) in Barre, MA from 1991-1995. She has been one of the teachers for the annual three-month retreat at IMS, and currently is an occasional visiting teacher at IMS and a regular visiting at The Forest Refuge in Barre, MA. Marcia teachesVipassana, Concentration, Brahma Vihara, and Creative Process retreats in various U.S. and international venues, and is dedicated to offering these ancient and timeless teachings in ways that make them accessible and authentic for contemporary culture.